11th Floor Diamond Trust Building, Kampala road. Asante Waste management provides bin bags, recycle bins and skip bins to suit your waste disposal and recycling requirements. We can also customize bins, skips, and storage vessels to specifically suit your waste and operational requirements. We work with you closely to ensure you receive the right bin hire and collection services to manage your waste, increase your recycling and minimize the amount of waste that is sent to landfill. Asante Waste Management’s online dumpster rental allows you to quickly find the right size dumpster for your project, schedule delivery and payment plan, all in just a few clicks. 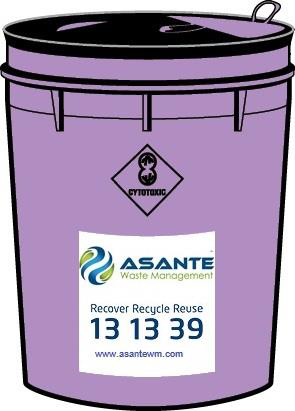 Contact Asante Waste Management about our bin and skip hire services. Our wheelie bins are collected using our either rear lift or side lift trucks. Ideal for businesses with space or access restrictions, scattered waste generation points, or those with perishable wastes. Asante Waste Management’s front end lift (FEL) steel bins provide a fast, maneuverable option for medium to high volume commercial and industrial applications. Medium to high volume waste producers such as commercial and light industrial waste. Skip bins (also known as Marrell bins) use a lift on/lift off system to provide a versatile single lift bin system. All our bin bags are appropriately labeled & coloured. Asante Waste Management will not collect, transport, sort or store any form of waste from any client without any bookings being made at least 4days in advanced prior to pick up. 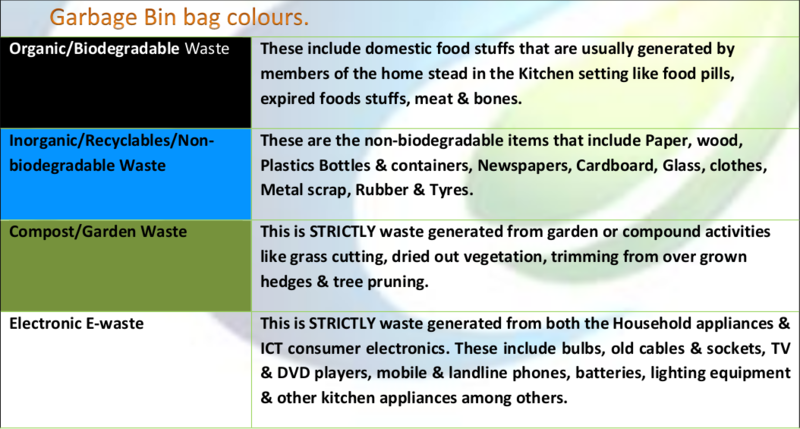 Confused about health care waste colour codes? The correct segregation of health care waste on site is vital to ensure that waste is stored, transported ultimately disposed of in the correct manner to comply with clinical waste regulations. 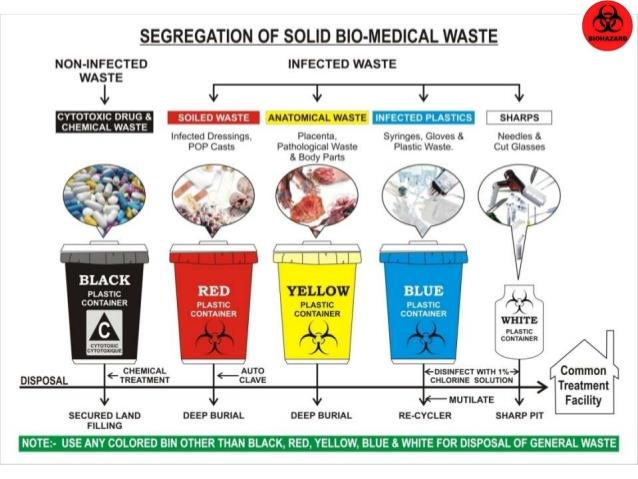 The Department of Health Safe Management of Health care Waste Memorandum outlines a best practice waste segregation colour coding scheme for producers of hazardous and non-hazardous waste to follow.  Professional, proficient staff to advise you on collection, storage and transport. Pharmaceutical waste consists of pharmaceutical (drug, remedy/medicinal substances), expired or discarded pharmaceuticals, substances no longer required by patients or departments and waste materials/substances generated during the manufacture and administration of pharmaceuticals. All pharmaceutical bins are lockable, lined with orange PVC plastic bags, have orange lids and/or bodies and are accompanied by bin stickers to ensure clear identification. are provided to manage sharps, human tissue waste, laboratory waste, animal waste, and waste resulting from dental, medical or veterinary research or treatment which has the potential to cause disease. Our clinical waste bins are lockable, yellow in colour, lined with yellow PVC plastic bags and accompanied by bin stickers to ensure clear identification and encourage compliance. Our range of pails includes 4 litre and 20 litre. Soft waste, fluids and sharps can all be placed in containers. Cytotoxic waste containers are available in 10 & 20 litre drums to manage material which are, or may have been contaminated with cytotoxic drugs in the preparation, transport or administration of cytotoxic therapy. This waste stream requires incineration as a method of disposal and must be packaged in purple containers that bear the ‘cytotoxic symbol’. Medical wastes are stored, transported and disposed of differently to general waste and the management of clinical wastes must comply with specific Legislative and Occupational Health and Safety guidelines. technology helping to prevent the spread of germs as part of our signature no touch sanitary disposal bin. odours that may occur throughout time.  Quiet, reliable operation for hygienic use.  Integral antibacterial technology – improving surface hygiene & helps prevent the spread of germs by inhibiting the growth of bacteria.  Waste transfer documentation provided.  Biofresh® inside every unit to eliminate unpleasant smells.  A choice of manual or No-Touch unit. At Asante Waste Management, we partner with our customers and communities to manage and reduce waste from collection to disposal while recovering valuable resources with the goal of creating a clean environment. We operate a fully comprehensive Waste Management Service to Residential, Industrial & Commercial businesses Nationwide. Our high quality products and cost effective services are tailored to meet your needs as we help you to achieve your environmental objectives.